A map from continuous integer ranges to some value, with a very specialized interface. CRM maps from integer ranges to values. The ranges are continuous, i.e. where one ends, the next one begins. So if the map contains the stops I0-3, the first range is from I0 to I1, the second from I1 to I2, the third from I2 to I3 and the last from I3 to infinity. Ranges must be inserted in order. Inserting a new stop I4 into the map will shrink the fourth range to I3 to I4 and add the new range I4 to inf. Definition at line 37 of file ContinuousRangeMap.h. Definition at line 86 of file ContinuousRangeMap.h. Definition at line 43 of file ContinuousRangeMap.h. Definition at line 41 of file ContinuousRangeMap.h. Definition at line 85 of file ContinuousRangeMap.h. Definition at line 42 of file ContinuousRangeMap.h. Definition at line 40 of file ContinuousRangeMap.h. Definition at line 39 of file ContinuousRangeMap.h. Definition at line 106 of file ContinuousRangeMap.h. Definition at line 107 of file ContinuousRangeMap.h. Definition at line 88 of file ContinuousRangeMap.h. Definition at line 90 of file ContinuousRangeMap.h. Definition at line 89 of file ContinuousRangeMap.h. Referenced by dumpLocalRemap(), clang::ASTReader::getGlobalDeclID(), clang::ASTReader::getGlobalIdentifierID(), clang::ASTReader::getGlobalMacroID(), clang::ASTReader::getGlobalPreprocessedEntityID(), clang::ASTReader::getGlobalSelectorID(), clang::ASTReader::getGlobalSubmoduleID(), clang::ASTReader::getGlobalTypeID(), isDiagnosedResult(), and clang::ASTReader::TranslateSourceLocation(). Definition at line 91 of file ContinuousRangeMap.h. Definition at line 93 of file ContinuousRangeMap.h. Referenced by clang::ContinuousRangeMap< serialization::IdentID, ModuleFile *, 4 >::find(), clang::ASTReader::getGlobalDeclID(), clang::ASTReader::getGlobalIdentifierID(), clang::ASTReader::getGlobalMacroID(), clang::ASTReader::getGlobalPreprocessedEntityID(), clang::ASTReader::getGlobalSelectorID(), clang::ASTReader::getGlobalSubmoduleID(), clang::ASTReader::getGlobalTypeID(), isDiagnosedResult(), and clang::ASTReader::TranslateSourceLocation(). Definition at line 102 of file ContinuousRangeMap.h. Definition at line 66 of file ContinuousRangeMap.h. 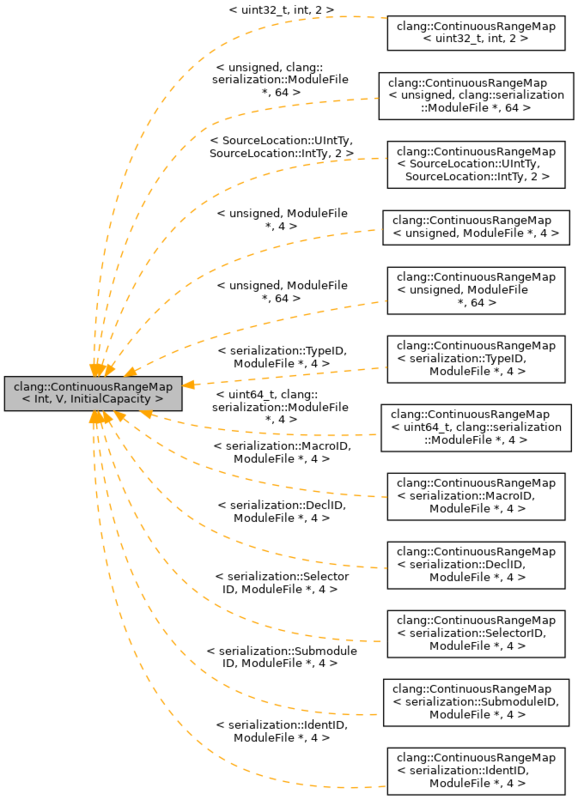 Definition at line 75 of file ContinuousRangeMap.h. Referenced by clang::ASTReader::isAcceptableASTFile(), and isDiagnosedResult(). Definition at line 136 of file ContinuousRangeMap.h. Referenced by clang::ContinuousRangeMap< Int, V, InitialCapacity >::Builder::Builder().